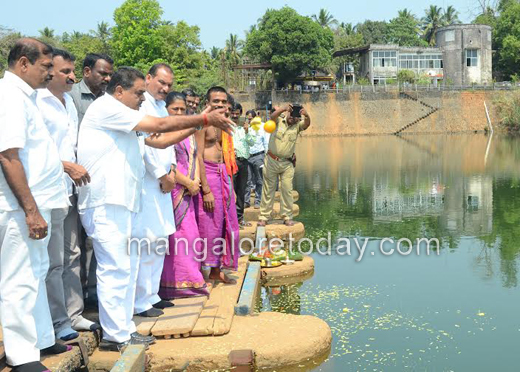 Mangaluru, Feb 27 2016: The new vented dam being built across the Netravathi at Thumbe to augment water supply to the city is expected to be ready by this June, according to Mayor Jesintha Vijay Alfred. At a gathering after offering Ganga Puja at the existing dam on Feb 26, Friday, she said that the officials of the Karnataka Urban Water Supply and Drainage Board (KUWSDB), which is building the dam, have promised that the completion of the dam would not be prolonged any longer. B. Ramanath Rai, Minister in-charge of Dakshina Kannada and Minister for Forests, Environment and Ecology said that if water was to be stored in the new dam up to a height of seven metres, more land would be submerged. Hence, once the new dam was ready, water would be stored only up to a height of four metres, as it was being done in the existing dam. Only after providing compensation to those whose land would be submerged, water would be stored up to a height of seven metres in the new dam. Further, according to an official of the board, only 15 per cent work of the new dam was pending for completion. The new dam has 30 vents (through which water flows) and 29 piers. Addressing the gathering, Minister Rai asked people to ensure minimum use of water. Earlier, at a programme to create awareness on groundwater conservation among gram panchayat members at BC Road, the Minister said that the multi-village water supply projects at Sangabettu and Karopay in Bantwal taluk were expected to be ready for water distribution in either April or May. They were among the five multi-village water supply projects being taken up in the taluk. The Minister said that the Rs. 52-crore second-stage drinking water supply project covering the jurisdiction of Bantwal Town Municipal Council was expected to be ready by June. About 50 per cent of works under the project have been completed now. Ivan D’Souza, MLC, urged the Minister to make it mandatory that those who build houses of 2,500 sq ft area and above should adopt roof-top solar energy units and adopt rainwater harvesting. He said that there is a need to create awareness on groundwater conservation in the entire State.